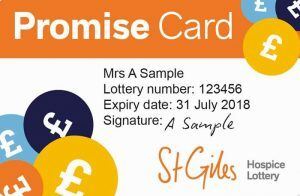 When you sign up to the lottery you’ll receive your exclusive Promise Card, as a thank you for your support. Your Promise Card entitles you to exclusive savings at over 150 shops and outlets across the region – including 10% off in our high street charity shops! See full list below. If you use your Promise Card regularly, you could save more than the annual cost of your lottery subscription, just like Mrs Holmes from Burntwood who saved £80 last year! See full list below or download a pdf here.